An integrated patio can be the cornerstone of your overall landscape design. A properly designed patio will create a fabulous “Outdoor Room” which becomes a natural extension of your home. A well designed pathway should not only be functional but also look pleasing to the eye. They should provide a natural passage between different areas within the landscape, guiding the traveler to designated areas such as a garden, patio or a water feature. The All Natural Landscape team has years of experience designing and installing “Stunning” patios, paths and steps that are functional as well as beautiful. 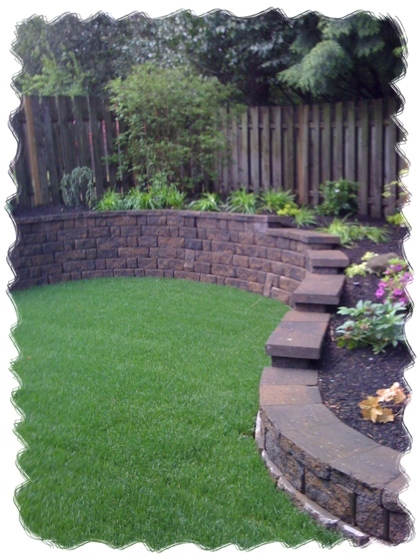 Walls can lend a variety of different elements to the atmosphere and ambiance created within your yard. Not only can a properly placed wall create a nice border to your yard, partitioning off different sections of the environment you wish to develop, but they can also serve to create different tiers within by producing plateaus or “steppes” at strategic places throughout your landscape. The All Natural Landscape team has years of experience designing and installing walls and plateaus that are, like our patios and pathways, functional as well as beautiful. Water features can lend themselves greatly to enhancing the natural environment within your yard. We all appreciate the sound of a gently flowing waterfall, or running water, and in fact, this type of sound has been shown to be quite relaxing and pleasing to the human ear. In some cases even a small pond can be quite soothing and lend to the natural beauty of your landscape. Maybe you prefer a meandering stream in your yard, or even the simplest of water features. Either way, All Natural Landscape can work with you to design the water feature that fits your yard, and your budget. Fences and decks are an integral part of a northwest landscape today. They provide both privacy and a setting from which you can enjoy your landscape. At All Natural Landscape, we believe that fences and decks should be considered early in the design process. The All Natural Landscape team would be happy to help you design the right fence and deck arrangement to help you obtain the most privacy and right setting for your yard. In fact, we’ll gladly provide you with a free estimate. Just contact us at via phone or by email. All Natural Landscape offers a wide verity of masonry services along with design consultation. Our masonry projects, natural stone, stone veneer and brick include fireplaces, chimneys, patios, steps, walkways and paths, retaining and accent walls, columns and pilasters. All Natural Landscape for help with your upcoming masonry project.